A gourmet black chocolate bar with a creamy orange, bergamot and milk chocolate ganache. 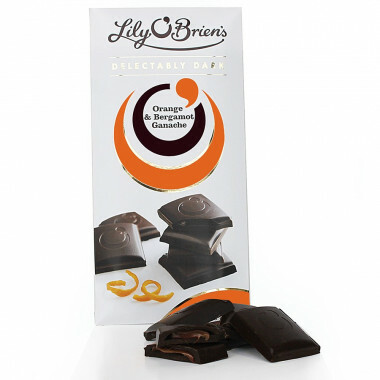 The Irish brand Lily O'Brien's has created an original recipe for deliciously gourmet dark chocolate. Rewarded with the Gold Taste Award 2016, this intense dark chocolate reveals a creamy orange ganache. The tip of bergamot brings originality and the mixture of chocolate with milk makes it all creamy. Ingredients: dark chocolate (70%) [sugar cocoa paste, cocoa butter, emulsifier (soya lecithin), natural vanilla flavors], milk chocolate (13%) [sugar, whole milk powder, cocoa butter, cocoa paste, emulsifier (soya lecithin), natural flavors of vanilla], glucose syrup, water, natural oil of orange, natural oil of bergamot. Allergen Information: See ingredients in bold. This product may contain traces of nuts and cereals containing gluten. This product does not contain artificial colors or flavors. Suitable for vegetarians. Dark chocolate contains 55% minimum cocoa solids. Milk chocolate contains 30% minimum cocoa solids and 20% minimum milk solids.